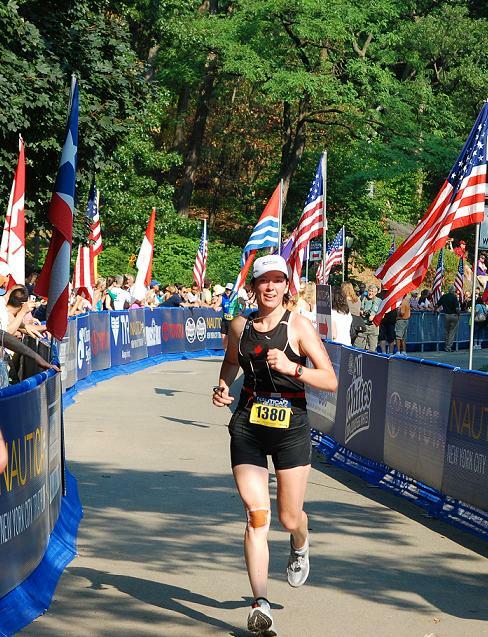 A bucket-list item checked off: I finished the NYC Triathlon. I’ve done several shorter triathlons, but this was my first Olympic-distance event: 1.5 km swim, followed by a 40km bike ride, followed by a 10km run. In the NYC Triathlon, the swim is in the Hudson river, the bike ride is on the West Side Highway, and the run is partially on the 72nd street and partially in Central Park. The race is all about New York — but a New York that is different from its commonplace day-to-day version. While doing this race, I tasted Hudson river. 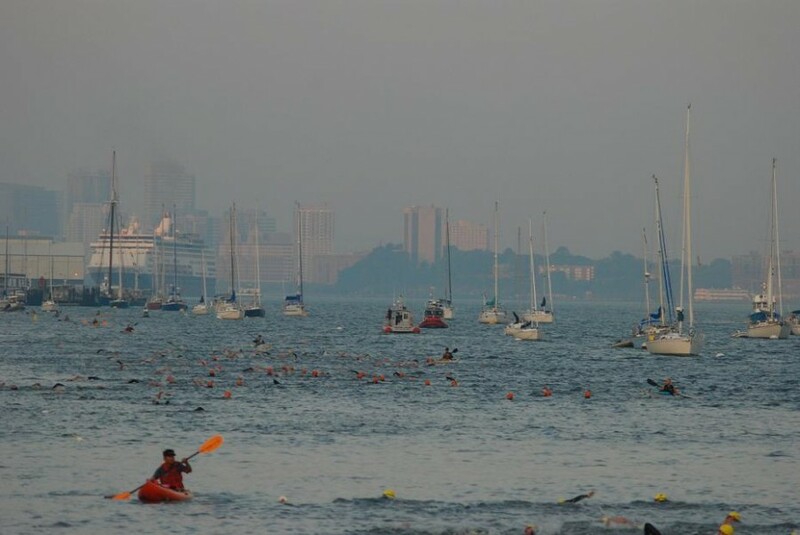 Swimming, you always get some water in your mouth — covering the 1.5km race course, from the 99th street pier to the 79th street Boat Basin, I tasted Hudson. If you’ve seen Hudson’s brown flotsam-filled water, you may be surprised to find out that Hudson tastes all right. Hudson’s water is salty (because of New York’s proximity to the ocean) and fresh (because of the strong currents in the river). Its murky brown look comes from silt; the debri, which the water is filled with, isn’t all that hard to swim around. 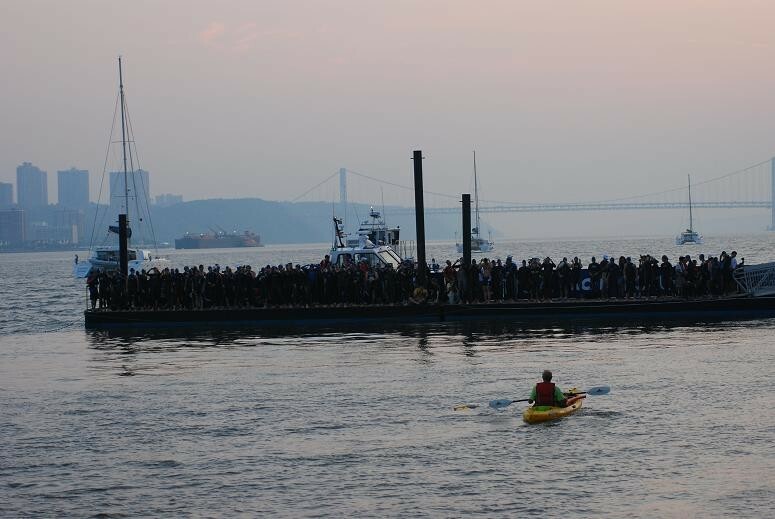 I also waited for the race start on the Hudson shore at the break of dawn. Waiting for a race to start is a prolonged in-the-moment experience. No cell phone to check, no book to read — in fact, nothing to do but just be where you are. The 5:30 am summertime Hudson shore in New York is a stunning place to just be. Vibrant colors, changing every minute. A cruise ship slowly backing into its terminal. Swans flying by. The scenery is stunning for everybody. For athletes waiting for the triathlon to get underway, the scenery, combined with the pre-race nerves, it is positively breathtaking. 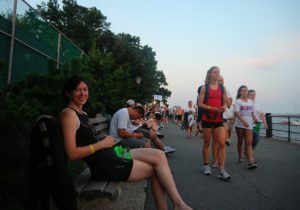 On the Hudson shore before 6am, waiting for the race to start. Swimmers preparing to jump into the water. 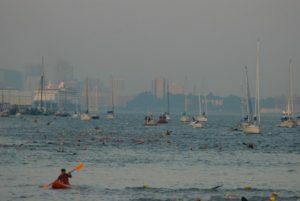 Swimmers in the Hudson, heading towards a distant cruise ship. In this race, I biked on the closed-off West Side Highway, and ran from Riverside Park to Central Park on the closed-off 72nd street. 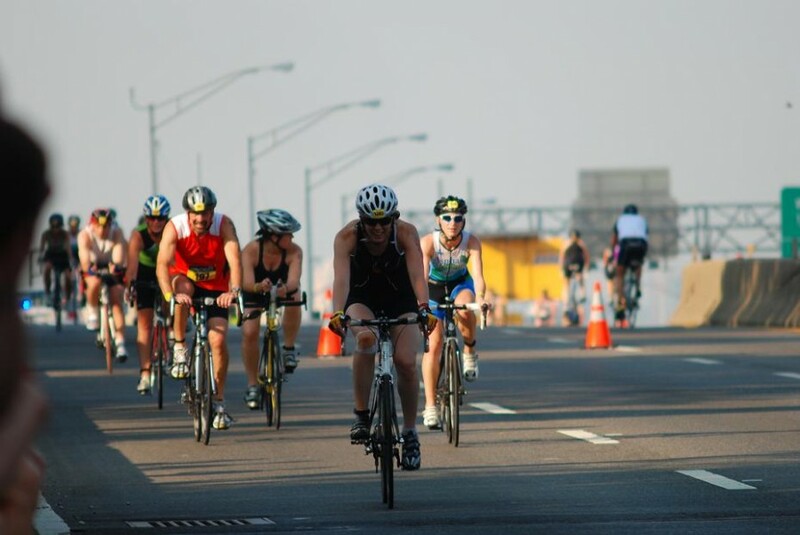 The NYC triathlon run has a 1-mile 72nd street portion and a 5-mile Central Park loop. While the Central Park loop is the day-to-day New York experience for many, the run on the closed-off 72nd street is a rare treat. There were relatively few athletes running close to me — I felt that this major iconic street was closed off just for me. Spectators were cheering seemingly just for me, too; cab drivers, stuck in traffic because of the street closures, hated me specifically as well. It was a hot Sunday morning in early August; New York was only waking up. Any other Sunday, I’d be reading the Sunday edition of the New York Times on a sofa in an air-conditioned room. 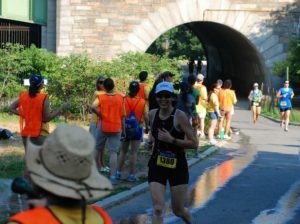 This Sunday I was running on the closed-down 72nd street, Hudson water and West Side Highway dirt caked onto me. I was in pain but in good spirits, prepared to tackle the remaining 5.5 miles of the race despite the heat, humidity, and lactic acid accumulation in my legs. I felt fully present in that weird and glorious moment. I felt alive. Running out of Riverside Park. 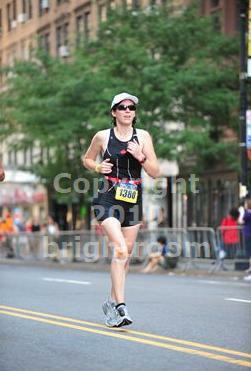 Caught by the official race photographer on the 72nd street. 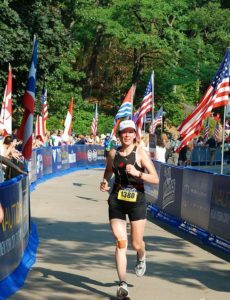 This entry was posted in Achievement, New York, Races, Running, Sports, Triathlon. Bookmark the permalink.